Tank Details: Juwel Rekord 70 61cm x 31cm x 46cm. 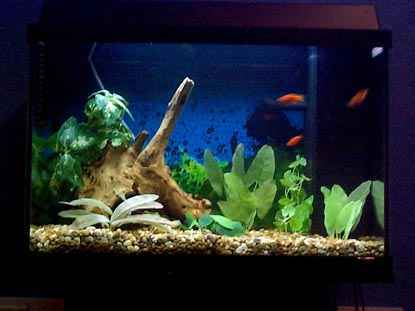 The Fish: 3 Platys, 1 Plecostomus Catfish, 1 pair of Dwarf Gourami, 1 pair of Firemouth Cichlids. Comments: I'm 17 and this is my first tank, no problems yet which is good, just the standard Juwel filter and stuff, only thing added is a wooden diffuser stone.